June | 2013 | Philippines: "The beauty within"
Politics, Religion, Employment, Health, Education…Full of Challenges But It's Fun! What are the easiest and the cheapest way to keep Healthy? Water therapy is a natural treatment for controlling diseases and keeping the body hydrated. All it needs is following instructions to a ‘T’ and drinking water. Water therapy is helpful in curing diseases without using medicine. When you reach home tired from work the only thing you want first is water. Nothing else refreshes better than a glass of cool water. Water is a very essential part of our life. It is a major constituent of our body and even of the earth. You may have been told by many people and doctors that drinking lots of water is very essential for your body. Water regulates different functions of body. It helps in digestion of food and formation of new blood. Life is incomplete without water. Water is free and has no calories. The Water Therapy Diet offers your body the amount of water you should consume daily. According to Dr. Griffin a licensed nutritionist, you need a minimum of 8 to 12 cups of water a day and since your body is made up of 55 to 60 percent of water, your body weight is able to fluctuate so dramatically and quickly. The Water Therapy Diet helps keep your water intake stable and consistent. Water therapy is so simple that it does not require expert supervision or professional guidance. Have a quick look at benefits that can be gained with the help of water therapy. It will almost feel like water is a magical drink. When you do not have a limit for doing things they may become a threat. Too much of a good thing can also pose a harm. This is true in the case of water therapy also. When water intake is not controlled while undergoing water therapy it may cause danger. It is because our body has limited capacity of throwing the excessive water. If this limit is crossed, body can face critical condition known as water poisoning or hyper hydration. This can expose a human body to the risk of brain damage or heart failure. So to avoid any risk you should always consult professional or doctors before undergoing any such therapy. It is important to know the pros and cons of any treatment, diet or therapy that you plan to take up. Practice water therapy according to given instructions and avoid overdoing it. Remember, too much of anything can be bad. Maintain a balance and enjoy the goodness of the wonder drink called, water. Human beings can survive approximately 30 to 40 days without food but without water your life can end in 3 to 5 days, says Phyllis A. Balch author of “Prescription for Nutritional Healing.” Without a sufficient amount of water, you can poison yourself with your own metabolic waste or toxins. Inadequate water intake can result in excess body fat, poor muscle tone and digestive problems, to name a few. The water therapy diet may need to be altered for medical purposes and is not backed by scientific documentation; it is imperative to consult with your health practitioner beforehand. You can prevent and even get rid of health problems by only drinking water. All you have to do is strictly follow these instructions. Drink 4-5 glasses (at least 160 ml per glass )of water as soon as you get up in the morning before brushing your teeth. Don’t eat or drink anything for 45 minutes. After 45 minutes, you may eat and drink. Drink 1 to 2 glasses of water 15 minutes after meals (breakfast, lunch, dinner). You should not eat or drink anything for 2 1/2 hours . Drink water thrice a day if you are suffering from Arthritis or Rheumatism. You should drink 1.5 liters of water each time. You should continue this routine for one week. Consult your doctor to find out whether water therapy will suit your body or not if you are ill or are already having a health problem. Initially, the idea of consuming 4 to 5 glasses of water in the morning may seem daunting. However, you can balance it out by drinking 2-3 glasses of water first and then wait a few minutes to drink the other remaining water required. The elderly, sick or those who may be unable to consume sizeable amounts of water may want to start off gradually and then work up to 4 glasses of water. Also, it may be best to use filtered water to diminish any parasites or other harmful substances. The liver is the main organ responsible for distributing and maintaining the body’s “fuel” supply. Furthermore, its activities include the breaking down of complex chemicals and the synthesis of protein molecules. The liver acts as a cleansing and filtration device; it also deactivates hormones, alcohol, and medicinal drugs. Its task is to modify these biologically active substances so that they lose their potentially harmful effects — a process known as detoxification. Specialized cells in the liver’s blood vessels (Kupffer cells) mop up harmful elements and infectious organisms reaching the liver from the gut. The liver excretes the waste materials resulting from these actions via its bile duct network. A healthy liver receives and filters 3 pints of blood per minute and produces 1 to 1.5 quarts of bile every day. This ensures that all the activities in the liver and in the rest of the body run smoothly and efficiently. 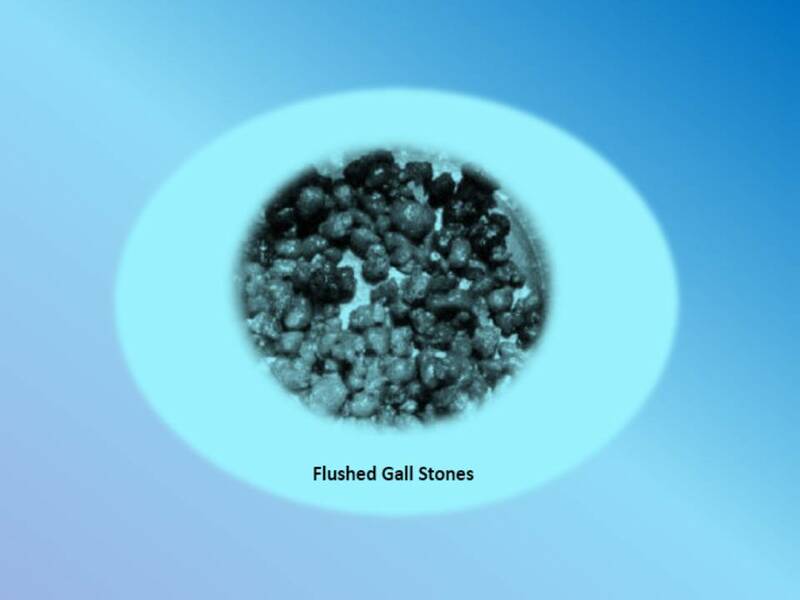 Obstructive stones consisting of hardened bile (termed “intrahepatic gallstones” by Johns Hopkins University) greatly undermine the liver’s ability to detoxify any externally supplied and internally generated harmful substances in the blood. These stones also prevent the liver from delivering the proper amounts of nutrients and energy to the right places in the body at the right time. This upsets the delicate balance in the body, known as “homeostasis,” thus leading to disruption of its systems and undue stress on its organs. A clear example for such a disturbed balance is an increased concentration of the endocrine hormones estrogen and aldosterone in the blood. These hormones, produced in both men and women, are responsible for the correct amount of salt and water retention. When stones congest the gallbladder and the liver’s bile ducts, these hormones may not be broken down and detoxified sufficiently. Hence, their concentration in the blood rises to abnormal levels, causing tissue swelling and water retention. Most oncologists consider elevated estrogen levels to be the leading cause of breast cancer among women. In men, high levels of this hormone can lead to excessive development of breast tissue and weight gain. Over 60 percent of the American population is overweight or obese. Men, women, and children in this condition suffer mainly from fluid retention (with relatively minor fat accumulation). The retained fluids help trap and neutralize noxious substances that the liver can no longer remove from the body. This helps the overweight or obese person to survive a major, possibly fatal, toxicity crisis such as a heart attack, septic poisoning, or massive infection. The side effect of fluid retention in the tissues, however, is that it causes these toxins and other harmful waste matter (metabolic waste and dead cell material) to accumulate in various parts of the body and further congest the pathways of circulation and elimination. Wherever in the body the storage capacity for toxins and waste is exceeded, symptoms of illness begin to occur. Cleansing the liver and gallbladder from all accumulated stones helps to restore homeostasis, balances weight, and sets the precondition for the body to heal itself. The liver flush is also one of the best precautionary measures you can take to protect yourself against nearly every kind of illness, known or unknown. You can often expect dramatic results even from the first cleanse. The morning after, you will have bowel movements mixed with food particles and floating green and tan colored stones in all shapes and sizes. The ones that float contain cholesterol and the ones that sink contain heavier toxic metals. Apple Juice (enough to drink 24oz a day for 6 days in a row). Note: Due to the high-sugar content of apple juice, you can instead drink Malic Acid powder mixed with water. This supplement softens the stones in the liver and gallbladder without the complications of apple juice. – Drink 24oz apple juice for 6 days. The malic acid in the apple soften liver & gallstones. Do a colonic to clear the colon so the stones can flush out. Have a very light breakfast. 10pm – Mix 4oz grapefruit juice w 4oz olive oil and drink it. Then lay down on bed with head elevated for 20 minutes. You’ll feel the stones relaxing. Vomit if you need to. After 20 minutes; go to sleep. 6am – Drink the third mixture of salts. 8am – Drink the final serving of salts. *By 10am you should be on the toilet. Follow up with another enema to ensure stones don’t remain in your system. Note: It may take up to 12 cleanses until you’re stone-free. Eight years ago, I have done a Liver/Gall Bladder Flush. This is effective but I wonder if you can go on without food in four days. I got this from a magazine article by Miss Maricel Laxa. (Here’s how). Drink 1 gallon Apple juice and 1 gallon Water each day (for four days). You will not feel hunger because of the apple juice (but I’m not sure with regards to your food cravings). On the fifth day continue the routine of drinking the apple juice & water, before going to bed – drink about ¼ cup of Virgin Olive Oil, Sip the lemon juice to avoid vomiting the Olive Oil. Lie on your right side. About an hour or two you’ll feel the desire of going to the toilet. Be sure it’s clean so you’ll see what have you just disposed. There should be no foul smell at all since you have not been having solid foods for four days. You should see solid waste similar to stone or rock wrapped with a plastic like substance (this is the olive oil). Drinking baking soda or bicarbonate powder, dissolved in water is a folk remedy that has been used for many generations to alleviate the symptoms of indigestion, heartburn, infections and arthritis, among other problems. Baking soda is an alkaline compound that reduces acidity in the body. The typical American diet is highly acidic, which allows many diseases and conditions to develop and flourish. Baking soda, taken in moderate amounts and at appropriate times, promotes healthy biochemistry. The typical American diet has changed greatly over the last century. In earlier eras, Americans consumed much more fresh vegetables, fruits, dairy products, while only eating moderate amounts of animal-based protein, which contributed to a healthy alkaline environment within the body. In recent decades, the American diet has become based on “fast foods,” refined and processed prepared foods, carbohydrates, sugary drinks and excessive amounts of high-fat meats. Modern diets produce much more acidity within the body, which compromises immunity and causes a variety of symptoms. Human blood must be alkaline to effectively transport nutrients and waste products, and to exchange oxygen and carbon dioxide with other tissues. Specifically, the blood must measure close to 7.35 on the pH scale, which is a logarithmic measurement of hydrogen ions and acidity. An acidic diet puts the body into a crisis because it threatens to lower the pH measurement of the blood. According to “Biochemical, Physiological and Molecular Aspects of Human Nutrition,” the body reacts by liberating calcium and magnesium from the skeleton and depositing it into the bloodstream and other tissues, which has an alkalizing affect. However, mineral loss weakens and disfigures bones and leads to osteoporosis, osteomalacia and arthritis. Excessive minerals in the bloodstream contribute to atherosclerosis, or hardened arteries. Further, acidity reduces immunity and promotes the growth and proliferation of pathogens, such as bacteria, viruses and parasites. Drinking baking soda dissolved in water is a quick and affordable method of neutralizing the effects of an acidic diet or meal. Baking soda readily dissolves in water and is absorbed quickly in the intestines. It can be helpful for acid reflex, indigestion or an upset stomach. The carbonation that occurs when baking soda is mixed with water can promote burping, which can relieve excess gas and bloating. According to “Human Biochemistry and Disease,” the alkalinity that occurs with drinking baking soda can dissolve the painful uric acid crystals of gout and relieve the inflammation of arthritis. Baking soda or sodium bicarbonate works as an antacid to neutralize excess stomach acid and provide relief for heartburn, acid indigestion or an upset stomach, according to the Mayo Clinic. Taking baking soda to reduce stomach acid is a short-term solution to relieve the problem. Restrict your use of baking soda to no more than two weeks. If you have recurrent or persistent symptoms, speak with your doctor. Also, adhere to the specific package directions or your doctor’s instructions for the amount of baking soda to take. Baking soda dissolved in water is best taken between meals. One or two teaspoons of baking soda in an eight ounce glass of purified water twice daily is a common recommendation for people wanting to increase the alkalinity of their body. (If taken with food, it will reduce the effectiveness of the stomach’s acid and compromise digestion. Of course, dietary changes are helpful too, but the baking soda is often easier for people to start with. Some people prefer pure bicarbonate powder, which has the same alkalizing affect). The mineral properties of Limes and Lemon become very Alkaline when entering the bloodstream. Step 1 – Pour 1/2 cup of water into a glass. Step 2 – Add 1/2 tsp. of baking soda. Stir with a spoon. Step 3 – Drink the mixture every two hours. Do not exceed eight doses per day. Step 5 – 1. Monitor your sodium intake. One teaspoon of baking soda contains 1,259 milligrams of sodium. The Institute of Medicine’s recommended daily intake for sodium is 1,500 milligrams for an adult with the maximum level being 2,300 milligrams. Consider alternative treatments if you are on a sodium-restricted diet. Do not drink or use milk products while taking baking soda. Some side effects associated with taking baking soda include headaches, loss of appetite, nausea or vomiting, slow breathing, frequent urge to urinate and unusual tiredness, according to Mayo Clinic. The chances of negative effects increase with the size of the dose, the length of time you continue to use baking soda and if you have kidney disease. The effects of the baking soda mixed with the water will line your stomach and usually takes around 20 minutes to 1 hour to kick in. Have a Happy Healthy Life!!! Detoxification is the term used to describe the process your body goes through to get rid of toxins. Detoxification methods of healing have been used for thousands of years. Fasting is one of the oldest therapeutic practices in medicine. Hippocrates, the ancient Greek known as the “Father of Western medicine,” recommended fasting as a means for improving health. Ayurvedic medicine, a traditional healing system that has developed over thousands of years, utilizes detoxification methods to treat many chronic conditions and to prevent illness. The body has natural methods of detoxification. Individual cells get detoxified in the lymph and circulatory system. The liver is the principle organ of detoxification, assisted by the kidneys and intestines. Toxins can be excreted from the body by the kidneys, bowels, skin, and lungs. Detoxification treatments become necessary when the body’s natural detoxification systems become overwhelmed. This can be caused by long-term effects of improper diet, stress, overeating, sedentary lifestyles, illness, and poor health habits in general. When a build up of toxic substances in the body creates illness, it’s called toxemia. Some people’s digestive tracts become unable to digest food properly, due to years of overeating and diets that are high in fat and processed foods and low in fiber (the average American diet). When this happens, food cannot pass through the digestive tract efficiently. Instead of being digested properly or eliminated from the bowel, food can literally rot inside the digestive tract and produce toxic by-products. This state is known as toxic colon syndrome or intestinal toxemia. Detoxification therapies try to activate and assist the body’s own detoxification processes. They also try to eliminate additional exposure to toxins and strengthen the body and immune system so that toxic imbalances won’t occur in the future. Detoxification symptoms—both physical and mental—may appear when you alter your lifestyle by starting something new, such as changing your diet or exercising, or by discontinuing a current habit, such as consuming a lot of sugar or drinking coffee.